Perdido Sun is your place in the sun. From your own private, beach-front balcony you can enjoy spectacular beach views of the clear emerald waters and dazzling white sand. Located on the 3rd floor, this spacious West end unit is perfect for family gatherings. Two Master Suites with King Beds and Full Bunks in the 3rd Bedroom. Electronics include 37" TV, DVD, VCR in Living Room and 32" TV, DVD, VCR in Master and Guest Bedroom, 26" TV, DVD, VCR in second Guest Bedroom. The Staff at Perdido Realty is always professional and helpful. We always go to them when staying in Perdido. The Perdido Sun was a great property. The view and layout of the unit was perfect for our needs. The indoor pool was awesome for this cooler time of year. This is our 4th time staying in this unit, LOVE IT! The Perdido Realty team gave us a positive experience. It was greatly appreciated. Thank you all! Staff always friendly and helpful when I am making my vacation plans and call the office with questions. 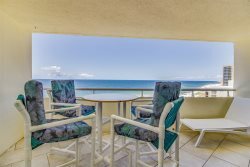 Perdido Sun is a lovely condominium. Great amenities! Perdido Sun unit 316 was excellent. Beautiful view, very roomy, kitchen was well stocked, bathrooms had plenty of towels. We had great time on the beach, the indoor pool which was kept warm, and the hot tub was hot. Would definitely stay there again. Rose at Perdido Sun is awesome very helpful, always smiling she made our visit there very enjoyable.